Last year I did a 9 week internship in the investment banking division of a bank up in the Wharf (see: 9 weeks in the Wharf), and at the end of this summer I’ll be going back to that bank to work full time (of course, also keeping up blogging and other projects that I’m working on at the same time.) Over those 9 weeks, I put a lot of effort into making sure I walked away with a grad job offer, and I have some very practical tips on how you can do the same. Every Friday during my internship, I would e-mail my manager and let him know what I’ve done during the week: who I’ve worked with, what types of projects I’ve worked on, what types of meetings I’ve attended, what presentations I’ve sat in on and anything else under the sun. Your manager will be one of the main people who helps decide if you’re right for the full time job (obviously), and there’s no way for them to know what you’re doing all the time – so you need to let them know. I also think filling your manager in during an internship shows just that little bit extra enthusiasm and dedication for what you’re doing. If I ever knew about a particular project someone on my team was working on, usually because I was on the same project, I would go out of my way to, in my quiet hours, find articles and useful material related to that project to e-mail to the team member concerned. This is a very useful way to spend your downtime (and, to be fair, as an intern that isn’t particularly very useful there is usually a good amount of this in internships). It also lets your team know that if they do give you that full time job, you would be a helpful asset to the team. What I was told before I started my internship is that I need to be the first one at the desk, and last one to leave. A lot of the time I did succeed in getting to the desk first, and in the times I didn’t I’d always kick myself about it, although in hindsight I don’t think it’s that big of a deal (just don’t come in late). When I first started my internship, I tried really hard to always be the last one to leave – but, particularly in busy jobs such as banking, sometimes this doesn’t really make sense. Someone on your team may be working really hard on a project that you are not involved with and have no intentions of leaving the office before 12am. If they know you have nothing to work on, and you’re sat at your desk giving a lot of face time – this isn’t a great look for you. I think what’s more important is to make sure you don’t leave the office unless everyone is satisfied for you to do so – always go around asking if anyone on your team has any work for you to do before you leave, even stay that extra 30 minutes to make absolute sure that they don’t, before you bounce. This shows a lot of dedication and willingness to help. If your downtime, a good way to buy a bit of time and learn at the same time – is to shadow. In my internship I ended up shadowing people from different teams and my manager as I decided it would be a good idea for me to see what team I may be interested in joining. I also spent a good amount of time shadowing people on my team. All you need, when that person is on your team, is to have a bit of confidence to ask them if they can walk you though what they’re doing; more often than not, people are willing to do so. On my internship, all of the interns took part in a program called ‘Meet the Director’, where we each had to set up at least four meetings with directors or managing directors in the bank. For a lot of us, the networking didn’t stop there. If there are any teams, roles, or even just people you are interested in – shoot someone an e-mail, and go and grab a coffee. I had a lot of coffees in my internship as I was really unsure about what I wanted to do full time – sometimes you think you know, and discussing with someone of the team can really enhance or even change your opinion. My future graduate occupation shifted at least three times during my internship, and once after my internship. Not only does networking let you know more about what there is out in the world and in the firm to do, it will also get your name out there. People talk – and if you can come across as an eager intern that is really willing to learn, it’s a good look. For me, this was easy, because I was on a team with only four other people; for people in massive teams – this becomes a lot harder As tedious as it may seem, you really do need to go out of your way to make sure you’ve introduced yourself to everyone on your team, and even taken people out of coffees. Your whole team will be discussing your progress when it comes to deciding on whether or not to give you a job, and you don’t want someone asking “who’s that?” during the process. Another tip is, if you’re in the office early, it’s quite quiet and you see someone senior – introduce yourself to them. This can be quite nerve-wracking, but I remember doing it once in my internship to someone very senior and they set up a meeting with me just to chat about careers and life that very same day. Every time they’d see me around after that, they’d always acknowledge me. Some key things (I think) to being a good intern, include just having the willingness to learn, and a good amount of enthusiasm. 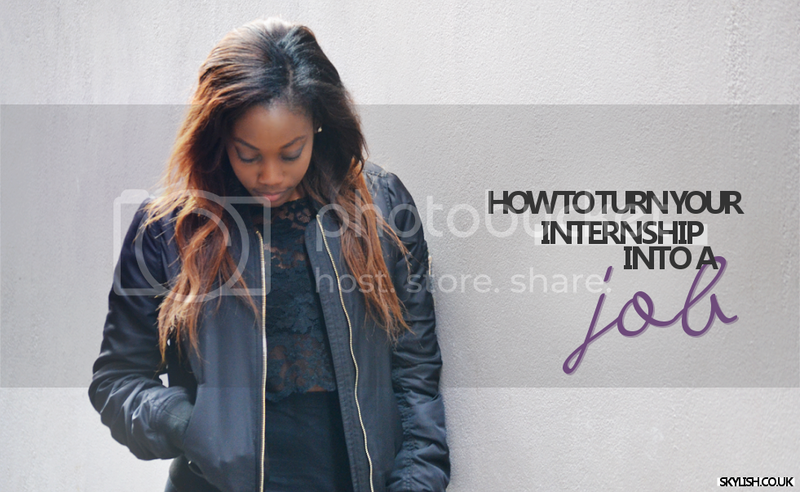 Internships are really not easy, in fact the constant yearn to impress gets tiring real quick. But they’re just for a short amount of time and whilst they last – you need to put your all into it. You really need to come into work everyday asking yourself what steps you need to take that day to make sure that in the end – you’re walking out with a contract in your hands. Of course you can get unlucky with a team you just don’t gel with, but for the most part, you can find a way to gel with almost everyone. We’re in a time where everything is getting more competitive – there are kids that have worked at three different firms before even starting uni, so you need to put you’re everything into whatever you do to make sure you don’t fall behind. When you walk away with that job offer, remember to celebrate. Pre-buy yourself some going out dresses, because a lot of people graduate without any job at all, and you’re lucky enough to be one of those that will! P.S. I’ve not got a newsletter! If you want blog tips, advice, exclusive posts and giveaways sent directly your inbox – sign up below (footer)! 4 Responses to "How to turn your internship into a job"